In the Bible, the issue of the Sabbath is a big one. There is, of course, the commandment to observe the sabbath and keep it holy, which is one of the Big Ten (commandments, that is, not football). 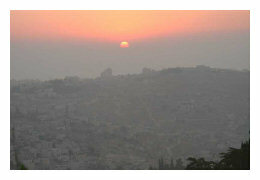 For the Hebrew Scriptures, the sabbath lasts from sundown on Friday evening to sundown on Saturday evening, and there is a long history — both within the Bible and in rabbinical literature after the Bible — about what it means to keep the sabbath holy, and what can and can’t be done during the sabbath period. By the time of Jesus, prevailing understandings about what it meant to keep the sabbath were often difficult for the average person to observe. One of Jesus’ criticisms of the Judaism of his time was that legalism often triumphed over compassion and basic human needs, and in relation to the keeping of the sabbath, Jesus famously said that the sabbath was made for human beings, rather than human beings having been made for the sabbath (Mark 2:27). In other words, Jesus was saying that sabbath time was meant to serve our needs for rest, reflection, prayer and worship, and regulations about how the sabbath was to be observed needed to be made and understood from that perspective. Americans, by and large, have trouble with sabbath-keeping. I’m not talking about the traditional sacred days of Saturday (for the Jewish people) or Sunday (for the Christians — although we do have trouble with those days, too), but about the broader idea of sabbath as a time for disengaging from our work for a while, and from much of our usual daily routine, in order to rest, recharge and reflect. And who knows: maybe pray a little bit, too. When most Americans think about sabbath time, we understand it in terms of vacation and we usually try to fill the time with as much activity as possible. So much so, in fact, that we often end up more exhausted by our vacations than we do from our normal daily life and work. Deliberately taking vacation as sabbath time doesn’t exclude activity, certainly, but is not so frenetic and allows more space for breathing room and for rest and relaxation. How do we know if our vacation has turned out to include sabbath time? If the time leaves us with a sense of refreshment and renewal rather than simply exhaustion. This is exactly what I hope is the outcome of my vacation which begins this coming Monday (June 21). It is a great blessing to be able to take a month-long sabbath time, and I always find myself grateful for the opportunity, and grateful to the people of Trinity and my fellow clergy and staff who make it possible. I hope that a good part of this time away will indeed turn out to be sabbath time, and that I will indeed return with a sense of being refreshed and renewed. Most of you will probably be taking some vacation time this summer, and I hope that you, too, will be able to experience some of your vacation as sabbath, as a slowing down to take a breath, take stock and take care. Jesus not only talked about the importance of the sabbath serving human needs, he also lived that in his own life. In the Gospels, we find a clear pattern in Jesus’ life of active work among people followed by time away for refreshment and renewal. Jesus knew that he needed this balance in his life – – and if he needed it, how much more do we need it, as well. So as I take some sabbath time, the blog will take some sabbath time, as well. Barring some unforeseen moment of inspiration that demands to be blogged, the next weekly blog entry will be the week of July 19. Until then, blessings upon all you gentle readers, and may that blessing include some quality sabbath time. Alexander Hamilton, author of The Federalist Papers, was a champion of American democracy, yet he wasn’t quite sure that the average American should be trusted to decide who should become President of the United States. Hamilton believed it was far better for people simply to vote for informed, knowledgeable and wise people who could then be trusted to choose the President. He was, therefore, a champion of the Electoral College, a body whose role was to make sure that the American people didn’t make a mistake. Rather than directly electing the President by popular vote, voters actually vote for electors representing a certain candidate, and it is those electors sitting as the Electoral College who actually elect the President. I suspect most Americans today would be surprised to learn that those electors are not required to vote for the person they were elected to represent. Rather, they are supposed to vote for the person they think would make the best President (in other words, they are to serve the common good). In practice, of course, electors these days always vote for the person they were elected to represent. And the Electoral College does serve another function, which is to balance out the power dynamic between more populated states and smaller ones. Nevertheless, the Electoral College system owes its existence, at least in part, to the fact that some of the drafters of the Constitution were a little uncomfortable leaving the selection of the President up to the sum total of the votes of the average guys on the street, who might choose someone based on, well, a less sensible set of criteria. So why am I going on about Alexander Hamilton and the Electoral College? Well, more and more it seems to me that Hamilton’s discomfort with leaving the Presidency in the direct hands of the American electorate was perhaps founded on a fear that has become all too true: that politicians, in an effort to insure that they get re-elected, will stop exercising genuine leadership and instead simply become people who enact the narrative that they perceive to be held by the majority of their constituents. In the modern era of instant polling and information collection, those who exercise leadership in government are not only able to keep their fingers on the pulse of the voters back home, but on just about every other vital sign, as well. And this ability, it seems to me, coupled with a culture that says the most important thing is to get re-elected the next time around, leads to an abandonment of principled leadership. The biggest mark of this abandonment is the infamous flip-flop: when a politician changes his or her position (sometimes a position held consistently for years) because the polls are saying that the position is no longer as popular. The flip-flop is often justified on the basis of service to the public: if my job is to serve my constituents, then I should understand what most of them want me to do, and then do that. After all, I am their representative, right? No. 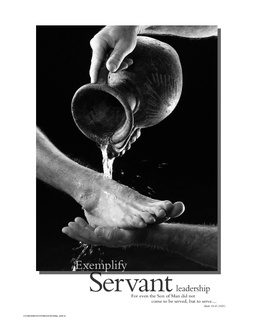 That is not what servant leadership is about. And neither politicians nor voters should assume that it is. Leadership is about having a vision, rooted in a set of core values and principles, and doing all that you can do to make that vision a reality. And the desire to make that vision a reality comes from the conviction that the vision itself serves the greater good of those whom you are called to lead. There is an episode in Mark’s Gospel in which two of Jesus’ disciples ask Jesus to give them positions of privilege: “Grant us to sit, one at your right hand and one at your left, in your glory.” The other 10 disciples hear this request, and they start arguing. This statement by Jesus is a statement about servant leadership. I grant that the middle section, where Jesus talks about being a servant and that whoever wants to be first must be the slave of all, could be used to justify the idea that a leader should simply do what most of those he or she is leading want to see done. I would point out, however, that Jesus doesn’t say “be the slave of the majority” but “be the slave of all”. At the end of the passage, which connects to the life of Jesus himself, he says that he “came not to be served but to serve, and to give his life a ransom for many.” If we see the way Jesus himself exercises leadership, he does not do so based on the majority opinion of his community. He takes no polls or surveys. If he had done, he would have become the revolutionary guerilla fighter against Roman oppression that most people wanted him to be. Instead, Jesus is unwavering in his commitment to a vision that says what is good for all people is what is good for the most vulnerable members of society. And he acts consistently in harmony with the values and principles in which this vision is rooted. Oh, and he gets crucified. That’s the part of servant leadership that is frightening. To have the courage to articulate a vision that serves the common good but may not be popular, and to act always in harmony with the values and principles that inform such a vision might mean that a politician would end up being electorally crucified: he or she may not be reelected. On the other hand, during the time that politician is in office, he or she might end up doing a great deal to serve the common good. And, that politician might gain something that is in very short supply when it comes to the way most Americans view their political leaders these days: respect. When we voters go to the polls to elect leaders, we should be voting for leaders whose vision, values and principles we respect. Those elected, the vast majority of whom in this country claim some form of allegiance to some kind of Christian faith, should then proceed to do what they were elected to do: to actually lead, based on the vision, values and principles they articulated when they asked us to elect them. And personally, I think they should follow the example of Jesus, and never take a poll again. They should be guided by their vision, they should serve the common good. History has shown over and over again that what is in our best interest is not necessarily popular. Jesus believed that something was right when it was rooted in a kind of passionate compassion directed toward the most vulnerable. But the most vulnerable are rarely popular. That kind of servant leadership may not get a person re-elected some day. But as Jesus also makes clear, politics is not supposed to be about holding onto power. Politics is supposed to be about serving others, about being a “slave to all“. Which is another way of saying that it is supposed to be about serving the common good, even when it isn’t popular. I attended a meeting this week which included a priest who is also a certified financial planner. Someone asked him how he described what he did to people. He said he considered himself a financial theologian, and that his role was to help people examine their finances in such a way as to make their lives “a consistent witness” to their values. This idea of making one’s life a consistent witness has stayed with me, and it reminded me of a phrase in the New Testament Letter of James, where the author talks about being “double-minded”. James, unfortunately, uses that term to talk about having doubts with regard to one’s faith (and, personally, I don’t think having doubts in the journey of faith is necessarily a problem). But that idea of being double-minded seems an apt description of most human beings at least some of the time, and some human beings nearly all of the time. To be double-minded is to maintain an allegiance to one set of values but live your life in a way that is inconsistent with those values. Sadly, we are treated all too often to very public demonstrations of such double-mindedness. Politicians who publicly carry the banner of what they define to be family values, only to have it discovered that privately, they live their lives in ways that are completely inconsistent with the public image they carefully cultivate and with the values to which they claim allegiance. The theologian Marcus Borg once observed that 90% of Americans say that they believe in God, but that it doesn’t seem to make a difference to 90% of Americans in terms of the way in which most people live. All too often we find churches and religious leaders preaching one thing, yet doing something very different. While we sort of enjoy the public disgraces and scandals that result when such double-mindedness is exposed, the reality is that we probably are afflicted by double-mindedness, as well, though I hope not as spectacularly and scandalously. The truth is that it is difficult, and requires some effort, to align our lives with our values in such a way that we do make a consistent witness. That same Letter of James also takes a rather dim view of the rich, of whom James says, “in the midst of a busy life, they will wither away.” I think he’s probably on to something. The more busy we become, the more easily we slip into double-mindedness because we become overwhelmed. We are less likely to take time and opportunity to reflect on our own double-mindedness and to have the energy to take steps to bring our lives more into line with our values. We become so caught up with things, we lose track of the more transcendent and enduring aspects of life, we become disconnected from God and from community, our relationships suffer, and we begin to wither away. In our preoccupation with the material aspects of our lives, we forget the spiritual aspects — and the spiritual is where we are meant to be rooted, and without it, we wither. Of course, when James uses the word “rich”, we often don’t think of ourselves. We think of people like Bill Gates or Oprah Winfrey, the folks who populate the list of the super rich. The reality, however, is that everyone who will read this article are among the richest people in the world. If you want to know your ranking, you can visit http://www.globalrichlist.com. There, you choose the currency you live by and then enter your income. It will tell you where you rank in terms of your wealth compared to the rest of the world. When I did this, it turns out that I am among the richest 1% of the global population. Over 99% of the world’s workers make less money than I do. When you realize where you rank wealth-wise in terms of the world’s population, it makes you think about the values you espouse, how consistent your life’s witness is, and what one’s responsibility to the rest of the world really is. The Baptismal Covenant of The Episcopal Church calls upon us to respect the dignity of every person and to strive for justice and peace. We commit ourselves to these ideals several times a year in church. But do our lives really reflect these commitments? From a global perspective, most Americans are quite wealthy, and with that comes a greater responsibility for the world’s welfare. The values enshrined in our Baptismal Covenant are rather counter-cultural. All you need to do is watch a few TV ads to realize what the dominant cultural message is: it’s your money, you worked hard for it, and you should reward yourself by buying lots of cool stuff. But how much cool stuff is enough? And is it possible to have a few less cool things, and instead, use that money to serve God’s purposes in the world? Would that help our lives to be a more consistent witness? Would it help us to align our lives more with the values we claim allegiance to? James bids us to beware double-mindedness and to beware getting so caught up in our material lives that, in our busyness, we wither away. Words to think about that may lead us to make some changes not just in how we think but how we live.